Obituary for Jeffrey L. Hamilton | Timothy A. Berkebile Funeral Home Inc.
Jeffrey L. Hamilton 69, of Bedford, died Thursday, January 24, 2019 at Select Specialty Hospital, Johnstown. He was born on January 12, 1950 in Harrisburg, a son of the late Elmer and Rebeca (Harris) Hamilton. On August 13, 1998 in Bedford, he married Sara (Harbaugh) Hamilton, who survives along with the following family: a daughter Jerrichah Ickes and husband Travis, of Bedford, a son Edward Scalla and wife Tina, of Bedford, Eric Scalla and wife Michelle, of Buffalo Mills, a son Jeffrey Hamilton, of California, and a son Cody Eicher, of Bedford; two grandchildren: Tenor and Sterling; two grand-dogs: Peyten and Marlee; a brother, Ronald Hamilton and wife Lena, of San Francisco, CA; and three sisters: Ellen Franklin widow of Ross, of Bedford, Sue Hamilton-James widow of Thomas, of Harrisburg, and Dauphine Logan and husband Mateo, of California. He was preceded in death by a brother and sister-in-law: Bill and Shirley Hamilton, and an adolescent brother. Jeff was a member of Christ Victory Church, in New Buena Vista. 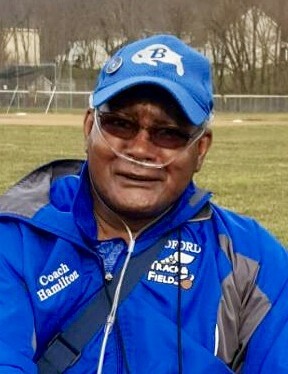 He was a Cross Country and Track and Field Coach for Bedford High School, and was the recipient of the Bedford County Sports Hall of Fame Special Community Award. Jeff enjoyed attending gymnastics with is daughter, and completed a half marathon in 2016.